Once again, Kansas for Life, a once great organization dedicated to saving babies has revealed its true face. (It's a face that looks an awful lot like a charlatan.) I've written about KFL before. You can find it here. Essentially, this is a very powerful organization that has put gaining and retaining power over principle. It's a shame. Yesterday, KFL sent some blast emails asking advocates to contact a targeted list of legislators and urge them to support legislation that will change the way Kansas appoints State Supreme Court Judges. 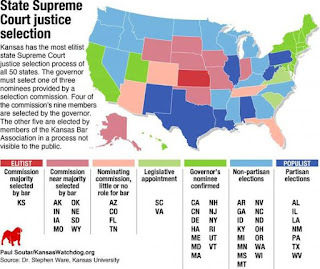 There's good reason to change -- Kansas is the only state in which a majority of the judicial nominating commission is composed of members of the bar. This process basically gives "the people" little to no say in who sits on Kansas' highest bench. And the bench does make a lot of decisions -- it's almost like they're making laws -- that stick forks in the backs of babies' heads. So, it makes sense for KFL to be involved and concerned about this issue. "Your Representative has been unreliable in defending life and is not trustworthy." Yep. KFL sent that email about a legislator that they give a 100 percent pro-life rating. I don't have words for the depth of my disgust. I take specific issue with the use of the word "untrustworthy." Those are strong words, especially for someone who as far as I know has never stabbed KFL in the back. KFL did eventually send its followers an apology about targeting Davis. "The first email alert with respect to Rep. Erin Davis was in error. We apologize to you and to Rep. Davis. She is a strong pro-life Representative and has a perfect pro-life voting record." I'll be honest. I'm a cynic, and I don't trust KFL or its leaders. This isn't a small thing. It could damage a pro-life legislator in irrevocable ways, because unfortunately, KFL remains a powerful force in Kansas politics. KFL's poorly timed email campaign could damage the reelection efforts of one of its advocates. Meanwhile, I imagine Rep. Davis had to spend a healthy portion of her day responding to irate constituents and trying to unscrew KFL's mess rather than advocating for life, reading legislation, etc. Please, if you are one who takes KFL's word for it, if you are a voter who takes KFL's endorsements at face value, stop it. Do your own research on life issues and candidates. KFL can't be trusted.